0:13 - 0:18: Tindalos Studio BFG Tabletop Montage. Battlefleet Gothic, imperial Fists and Necrons spotted. 0:19 - 0:21: Mood Lighting, Flora and Warhammer... Good looking studio. 0:23 - 0:25: Ork Stompa (Red Sunz?) in the background as well as a lot of books and models. 0:46 - 0:48: Blackstone Fortress falls and collides with a Hive City. The city burns significantly, and in the background Chaos warships can very vaguely be made out through the fiery haze as they open fire on the city. 0:49 - 0:52: Planet torn apart, this appears to be a direct game cinematic which causes me to believe that the campaign will use the same art style as it's predecessors campaign. 0:52 - 1:01: Artwork showing the area the Cicatrix (Expanded Eye of Terror) covers. Only several systems are noted within the artwork, and this may perhaps be related to gameplay in campaign terms. 1:02 - 1:03: Great Unclean One? In a design studio....... seems appropriate. 1:07 - 1:13: Ship Listing Time: Chaos Desolator BB, Chaos Despoiler BB, Chaos Styx CA, Chaos Hellbringer CL, Chaos Murder LC , Chaos Carnage LC, Chaos Slaughter LC, Chaos Infidel Raider, Chaos Iconoclast Raider, Imperial Mars BC, Imperial Sword FF, Imperial Cobra DD, Imperial Dauntless or Enforcer CL, Imperial Dominator LC, AdMech Ark Mechanicus BB, AdMech Cruiser LC, AdMech Light Cruiser CL. 1:07 - 1:13: After careful observation, it appears the weapon systems of Ad Mech Warships may have the same treatment as Ork vessels in BFG:A(1), with the hull remaining the same but the weapons being chosen by the player. This would certainly match their lore of "We get only the best gear." 1:15 - 1:16: They like their inspirational posters it would seem. 1:18 - 1:25: More factions than the original game, which we know as numbering 12 at current times. Interestingly though, we know that there will be MULTIPLE campaigns based upon the words of Romain during the interview. (Lord Admiral Ravensburg on the old forums). 1:25 - 1:26: Background of a Necron Tomb World that is very much awake is visible, and we can see 2 Cairn Class BB's, 2 Wraith Class CL's and 2 Scythe Class Harvest ships up close. 1:28 - 1:30: Kroot Warsphere & Demiurg Stronghold can be seen attacking a Necron fleet consisting of 7 Scythes and a Cairn Class. It is notable that there are other Tau vessels giving fire support outside of the picture, but a Necron fleet of that size is indicative of just how 'large' these battles may become. 1:30 - 1:31: (Possible) Aeldari Corsairs fleet consisting of a Voidstalker Battleship, several Shadow or Eclipse Class Cruisers, a Solaris Light Cruiser, a Drukhari (Dark Eldar) vessel that is brand new and didn't exist within the original game mounting what appears to be a varaient of Pulsars and a Wraithship Cruiser against a Necron Fleet (Wraith + Cairn) although it is indicative that there are more enemy vessels based upon the direction of the Eldar vessels firing. Of even more interest though is the background, which contains a Dark Red and White Craftworld of massive proportions, perhaps Saim-Hann? 1:32 - 1:32: Eldar x Necron fan fiction moment with Wraith and Eclipse Class vessels. 1:35 - 1:38: TIME FOR SOME FREE FOR ALL FUN! 1:49 - 1:54: All 12 factions are available in Skirmish + Multiplayer from day one. 1:55 - 1:57: This appears to be the large Tyranid creature from the release trailer. Againwe see the design of a well armoured 'head' with an exposed rear. Also, the creature appears to have a sort of contracted muscle in four places on the side of it's body, perhaps a kind of organic launch bay or weapons bay? 1:58 - 2:00: Close up on a Cairn Class, we can see it's stats as well as it was then. 1200 HP, 0/50 Shield, 75 Armour all around, 14 defense turrets, 150 speed, 0/4 rotation speed, 7500 detection and 60 troop resistance. Not sure how accurate these stats are but it they are then it means the necrons either have an amazing ability range or have been toned down power wise to meet everyone else. 1:58 - 2:00: MASSIVE IMPROVEMENTS IN HUD! When a ship is selected the stats are clearly showed on the left, with large easy to read text, clearly visible HP bars and basic toggle modes above this panel. On the bottom of the screen we can see an ability panel, with many abilities from BFG:A(1) staying from the game apparently. And in the top right corner we have a nice and easy to read list of all ships within the faction! 1:58 - 2:00: There appears to be 7 ships in the display necron fleet on the mini-map and ship list, whilst there opponent has significantly more. Perhaps Necrons will stay as far less numerous, and the stats from before are just partial placeholders? 2:00 - 2:10: Aeldari Craftworld Montage featuring a big as all hell Craftworld. Saim-Hann still? 2:11- 2:13: Drukhari / Dark Eldar vessels appear to have gotten an overhaul, but coupled with earlier images it appears that the Dark Eldar will be combined with some Craftworld Eldar vessels to create a combined Corsairs fleet with vessels from both the Aeldari & Drukhari to make a full list. 2:14 - 2:16: Very limited angle close up on a Ark Mechanicus mounting a lance battery and two macro cannon batteries. 2:25 - 2:27: Imperial Fist Fanboys (Looking at you Valrak) may now proceed to wet your pants in excitement, as this appears to be the moving fortress Phalanx on screen. It may also be a star fort of generic description, without seeing an certain iconography on it I cannot be certain. 2:31 - 2:35: Three things here. 1) The purple beam in the background has been thought to be a Blackstone Fortress. Entirely possible, albeit unconfirmed. 2) The terrain for the battlefield looks very good. 3) You'll notice that the ships have taken on an almost model like appearance, I'm unsure if this is because of a change in game art style or just a side effect of this particular clip being an animation rather than a direct gameplay clip. 2:33 - 2:35: I AM DUMB! SAY HELLO TO DA BIGGEST AND DA BESTEST OF DA ORKY TEKNOLUGE! INTRADUCIN DA ROK, BIGGEST AN BADDEST ROK IN DA GAAXEE! 2:38 - 2:40: Also, last time I checked the models were not 10cm long sadly. 2:39 - 2:39: Craftworld in progress. 2:40 - 2:42: Unidentified structure. Possibly a fortress of some sort, or maybe a space station? 2:57 - 3:34: The Designers are long term 40K fans which I think is a good thing, and it showed with the level of detail they put into the last game in my opinion. This concludes my findings based upon the video, if you have more to add or want to discuss my findings, feel free to bring it up below. 0:29 - 0:32: In-game footage of a Scythe Class Harvest Ship in the foreground. There appears to be an Adeptus Astartes Strike Cruiser a short distance away, which is dwarfed in length by the Necron vessel. In the background we can see another Necron Vessel (Shroud Class Light Cruiser Possibly?) either exploding or being hit with a weapon similiar to a Nova Cannon, albeit red tinged. As the opposing vessels appear to only be Space marines, this may either be a weapon rework or a skill such as a plasma bomb with a changed colour. Possibly not a weapons hit, but a Necron Solar Pulse Generator being triggered? 1:32 - 1:33: Hellebore Frigate + Horde of Aeldari bombers up close and personal with a Necron vessel, possibly a Dirge or Jackal Class Raider. A second Aeldari vessel appears ot be directly in front and obscured by explosions, and a Green Beam (Gauss) is either being fired by the Necron Vessel to a target off screen or vice versa. IF it is the former then this is major, as it means they can use some form of [Scary Death Beam] in any direction, not just in a forward arc. Also, again over a Craftworld. I suspect what you've called the scary death beam is the Tomb Ships Particle Whips. 1:35 - 1:38: Battle Barge in the foreground firing on a Scythe Class ship. Quite a significant amount of Necron Vessels are present. but the real gem here is the Tyranids. The Tyranid vessels look completely unlike their models to the point where I think GW has given Tindalos free reign on their design. They appear to have heavily armoured 'head' sections and apparently liek to close with their enemy and ram them. A possible Hive Ship (Middle Back Right) is visible and appears similiar to it's original design, and includes some form of blue ranged beam attack. ALSO we catch a glimpse of black particles swirling around the Tyranid vessels. Perhaps this represents the Shadows of the Warp, some form of living shield to save it from damage or a swarm of creatures. The exact nature is as yet undetermined. 2:17 - 2:20: We get a glimpse of the Tau Merchant Fleet, and it's interesting. In the bottom left we can see some traditional vessels, a pair of 'Hero' Class Cruisers from the tabletop and in the background a few smaller vessels from the Tau protector fleet can be spotted, such as a Emissary class Light Cruiser. BUT the star of the show is the massive vessel in the center screen. Four Orca Gunships can be seen attached to the vessel on grav-hooks, and the pure size of the ship suggests that it's entirely new to the faction, and based upon my initial thoughts it is probably a Heavy Carrier type vessel. 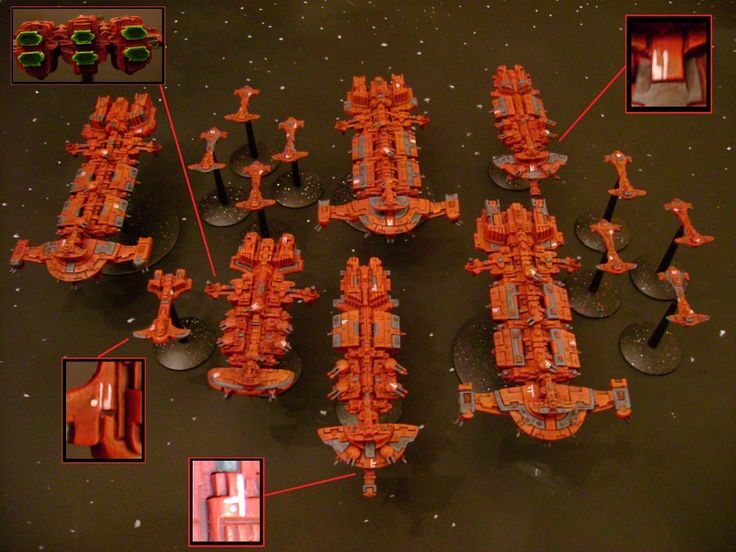 HOWEVER, while I do say all this, I am ignorant of the lore behind the Merchant Tau Fleet so if anyone can correct me I would appreciate it. I don't see any Orcas on it, or the Grav-hooks. It looks to me like a regular Merchant fleet Cruiser in the foreground with the ships in the background being far away. Blackstone Fortress or perhaps Planet Killer is my bet. 2:38 - 2:40: Unidentified Eldar vessel, I cannot work out what it's supposed to be and couldn't get the image clean enough to read the text. A special dragonship, "The Flame of Asuryan" Prince Yriel's flagship. 2:44 - 2:45: Am I going crazy or does that vaguely look like a Grand Cruiser hull with a Imperial Prow... I believe Caliger wrote about just such a ship... GIVE ME MY GRAND CRUISERS! Avenger Class Grand Cruiser unless I miss my guess. After looking back, i think that was the vessel being destroyed as the Battle Barge instantly changed target after the light bloom faded. I knew that vessel looked familiar, remind me to go and murder Lexicanum and then to throw myself off a bridge. If you look on the front of the vessel though it appears to have some ships perched on it's prow. Although based upon the angle these may just be railguns and m,y half-blindness is coming back to bite me already. Definitely Railguns mate. Out of all of them the Merchant fleet has me the most 'concerned'. Because while they did make the Protector Fleet OP in BFG:A despite it being one of the weaker fleets. The Merchant fleet was completely at the bottom of the pile. Worse ships than Orks, and too slow to evade anybody. Merchant Fleet is by far the bottom of the pile, I doubt anyone would have issues beating them in the tabletop at all. It still makes me question how they will be changed for BFG:A(2) to make them even a remotely equal competitor, the only thing in my mind at current would be to raise the number of ships but that is only a stop gap at best in spacial warfare. @archmagos-alexi All I can think of is that they're "retrofits" with more modern technology. Perhaps more upgrade slots and cheaper upgrades to make up for general inferior design? @kadaeux It's possible. For now we wait and see I guess. One theory some others had was that the Protector Fleet would lose access to the Auxilliary Faction ships, which would instead be passed over to the Merchant Faction. Frankly this does seem like a good balancer, having a group of low cost but relatively weak Tau Vessels alongside a group of powerful main liners in the form of the Demiurg Commerce Ships & the various smaller support vessels, like the Nicassar & Kroot ships. I think that'd work. Merchant ships as filler. Maybe also even actually give them the Gravity Hook carried ships completely without costing the points. @archmagos-alexi Not to the full count unless i've forgotten something. But it's been a long time since I played with the Tau. Is reinstalling anyway so will check. @shadowsfm Then it's not a Grand Cruiser, as the Repulsive was never refitted with an Imperial Eagle Prow. So possibly just a Heavy Cruiser? He's right. I've just gone over all my BFG rules and files, including the BFG magazine. The prow structure IS consistent with the 'hybrid' Grand Cruisers. But not one of the 'canon' ones. Thank you for the Analysis @Archmagos-Alexi, it was most helpful. My own notes as a Necron enthusiast (who is qualified to talk about literally nothing else. 1:32-1:33 That's a Dirge class raider. The Jackal has an extra section before the curve towards its engines. Also, the collision effects, fighters, and particle whip (which is in no way like an actual whip b/c warhammer naming is silly) all look really nice. 1:34-1:35 I also count 8 Necron Vessels. 3 Scythe Class cruisers, 1 Cairn Class BB, and four escorts. The forward most ones are flatter, and thus probably Dirge Class, while the other two have more raised pyramids, meaning they are likely Jackal Class. So the order of battle is 1 Cairn, 3 Scythe, 2 Jackal and 2 Dirge, which is loreful as Cairn never have less then 3 Scythes with them. Looks like they are going with the Necron Naval Master Race lore, (1v5 ez IoM, probably worse for Eldar b/c they lose the speed advantage and all necron weapons ignore holo/shadow/mimic fields) especially considering all the dead Eldar in the picture. 1:35-1:37 As far as I can tell: 3 Carin-Class BB, 6 Scythe Class Cruisers, 1 Shroud Class CL, 1 Jackal Class Raider, 1 Dirge Class Raider. 1 non ID ship on both sides of the battle. Also is it just me or do the Nid ships look like graboids from tremors? Also it seems the middle one has feeder tendrils. Due to each side hitting each side with their weapons, this confirms 3 way battles, which should be great. Also interestingly in part two of the scene it seems mid top left there is a ship closer to the planets surface than the rest, so maybe the Z-axis will exist in this game like it does in real space combat. Cairn also seem to have that split fire feature they had in the original game, and the right firing weapons seem to be Particle whips while the Left one seems to be a lightning ark. 1:41-1:44 7 Dirge Class Escorts, 3 Shroud Class CL, 2 Scythe Class Cruisers, and 3 Cairn Class BB. Interestingly, lots of fighters, while none of the above classes are capable of fielding said fighters. Necron carrier offscreen maybe? 1:58-2:00 The Cairn class stats are probably placeholders from the model it was shaped from. Note under its name it is referred to as a dauntless. Necrons are supposed to be outnumbered, so the rest of your post is probably correct. That's about all I'm qualified to talk about. Only other comments on the video I have is that 2:50 he seems to be holding a book for referencing, and with all the models and thin, codex sized works on the shelf I believe they are well read in lore, always a good thing. Anyways, that's my analysis of the vid, hope that helps. @zeetheranok Greetings Zcee! It is indeed I, Xanxas. It seems you made an account over here as well as in EC. I’m quite excited for what will be our biggest showing yet! How do you feel about the sequel so far, yea or nay? Additionally, did I miss anything, did you see something my analysis missed? Either way, I’m glad to see you here. May you Wars be glorious, and your fleet eternally ascendant! @hjalfnar_hgv i see they do have space wolves fans there, so don't worry. and there was a space wolf fleet in the previous game, so i'm sure this won't be any different. and lore wise, they were there to defend cadia during the 13th black crusade, right? I am most excited to the sudden development in this. Necrons will rule the galaxy.